Are you guys ready for me to finally choose a new cuisine/country? I am. In fact, I’m so excited about this cleanse being over and me getting back on track with my culinary trip around the world that I’ve already chosen my next two destinations. Should be good times. But first, one last transition recipe to tide you over until Monday. Perhaps you’ve already noticed something different? I’m playing around with the idea of changing up my post format a bit to give you guys a flavor of the destination beyond just the food. Bear with me for a couple weeks while I try to get into the groove of the new style and work out the kinks (and try to figure out an easier way of making these photo collages!). Despite my love of Indian food, I can’t say that the major cities in India are on my short-list of places to visit. I think I’m afraid of the crowds, heat, and sensory overload in general. 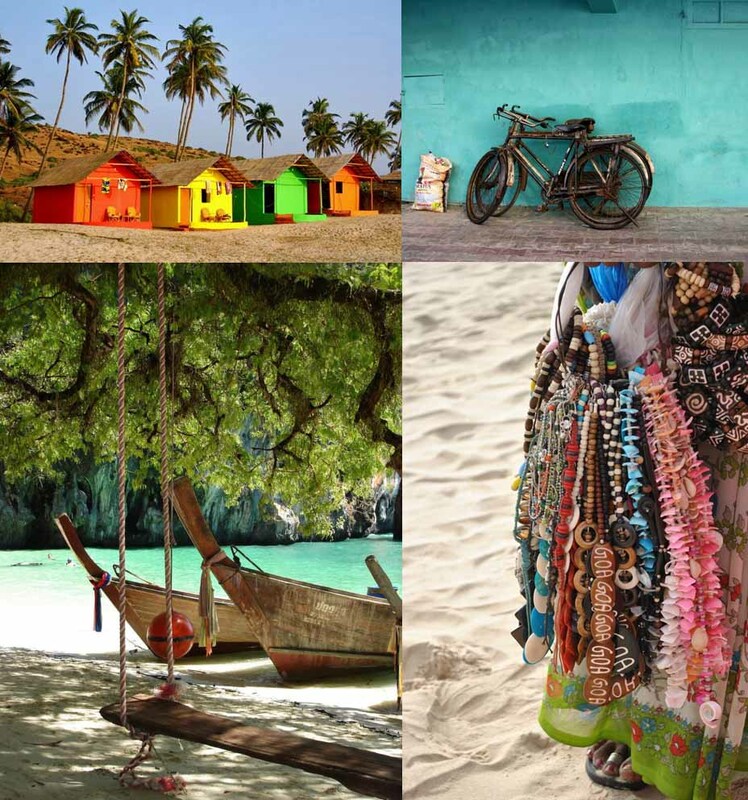 The coastal region of Goa, with its colorful beach shacks and laid back vibe, is another story altogether. Another draw? The food. 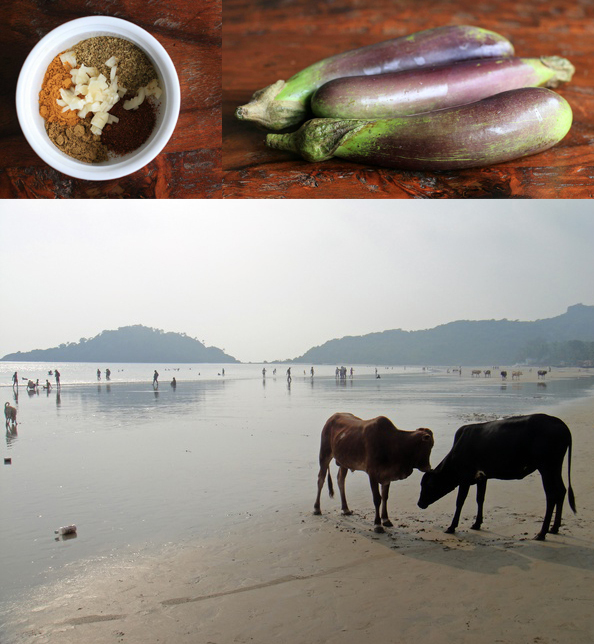 I’ve loved every dish I’ve ever had from the Goa region, including this shrimp and eggplant curry. 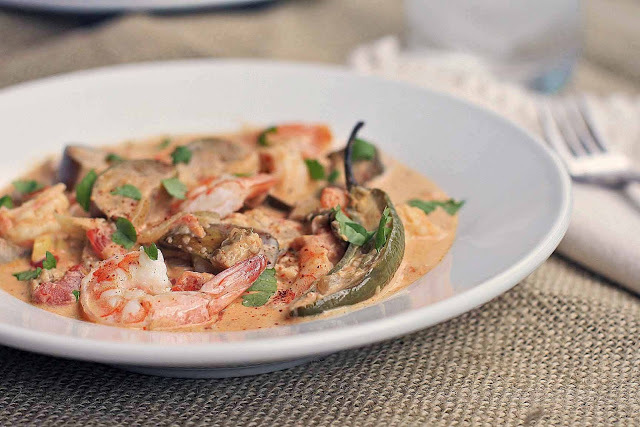 It’s filling without being heavy and while the Serrano chile pepper and ground cayenne add plenty of heat, it’s tempered by the creamy coconut milk. I’m not the only one who is a fan; it’s a dish that I always get repeat requests for. I think you guys will love it too. Heat the oil in a large saucepan over medium heat. Add the onion and cook until softened. Add the garlic, cayenne, coriander, cumin, and turmeric and cook, stirring frequently, for one minute. Add the tomato and tomato juice and cook until the tomato has almost completely broken down; use the back of a wooden spoon to help break up the pieces of tomato, if necessary. Add the eggplant, chile peppers, salt and mix well. 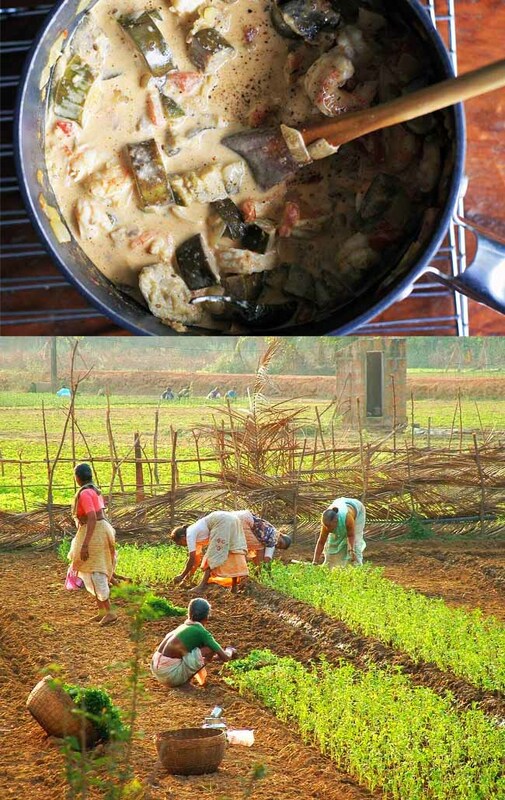 Cover and reduce heat to low; cook until the eggplant has softened, about 7-8 minutes. Add the shrimp and cook, stirring, just until the shrimp turns pink. 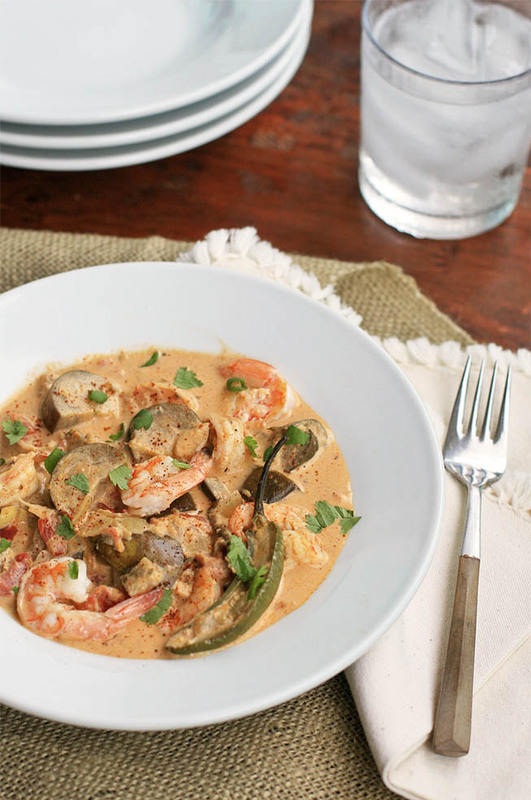 Add the coconut milk and simmer gently until the coconut sauce is hot and the shrimp has cooked through. Remove from heat and stir in the apple cider vinegar. Top with the chopped cilantro and serve atop a bed of rice… brown basmati is a particularly nice match.